Good night/morning everyone, Bonjour Bev, Heather, Ferenz, Kimf, … ! Last edited by Philjo56France on Wed Jan 16, 2019 1:54 am, edited 1 time in total. Jan 16, 11:03 AM jd_AEF (Moderator): 5 am Samson and A2 greet each other with vocals. Last edited by Ferenz on Wed Jan 16, 2019 4:49 am, edited 1 time in total. Thanks Philjo and Ferenz ! jd_AEF (Moderator): Today's Hamlet forecast: Cool day in mid-40's increasing to upper 50's through the afternoon. No rain expected. Light winds less than 10mph. Thanks so much Ferenz ! tweetie_AEF (Moderator): Good Wednesday afternoon, faithful Hamlet viewers! 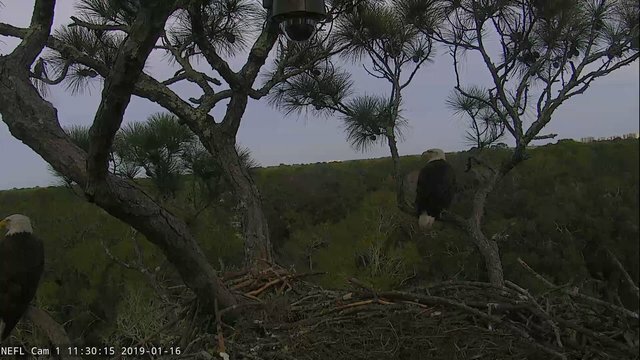 Pretty quiet this afternoon so far, the eagles must rest or fish this time of the day. 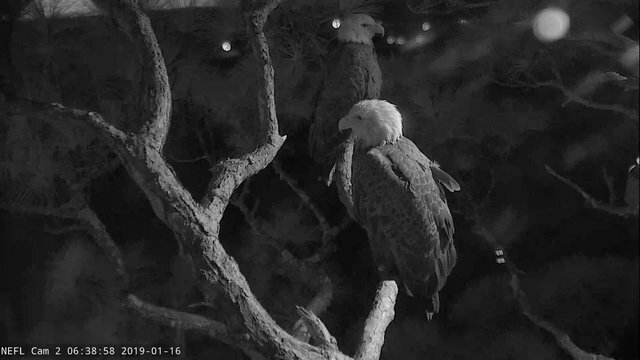 Some distant vocals could be heard a little before 1:00, but no eagles visited the nest tree at that time. Chances are good we will see more of Samson and his friends later today! jd_AEF (Moderator): I see earthwalkers nearby so they flew. 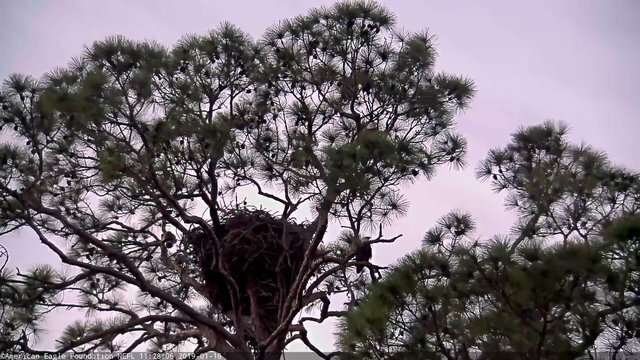 jd_AEF (Moderator): Samson and female eagle arrive at nest 5:40 pm...appears to be A2. LisaS_AEF (Moderator): Good Evening, Female Eagle can be viewed on cam 1 now. GoodNight Philjo , Ferenz, Heather and everyone ! Good Morning NEFL. ..Philjo , Heather , Ferenz and everyone ! jd_AEF (Moderator): Good early morning Hamlet! 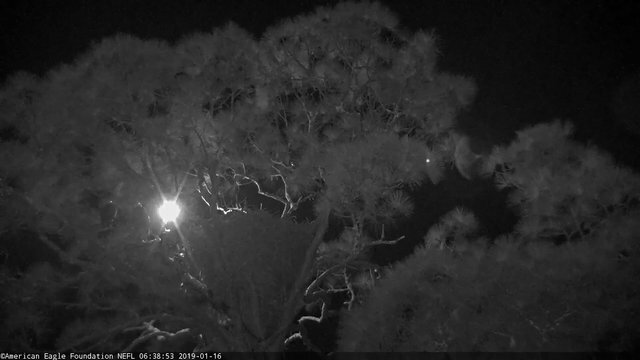 As of 4 am Samson is perched on Sunset Branch and A2 is perched on one of the sleep branches. All is quiet and peaceful at this time. Jan 17, 11:57 AM jd_AEF (Moderator): Today's Hamlet forecast: Clear and Cold start to the day, temps low 40's increasing to mid-60's through the afternoon. No rain expected. Light winds 5-10 mph. Please join us for evening chat 6-8pm EST. 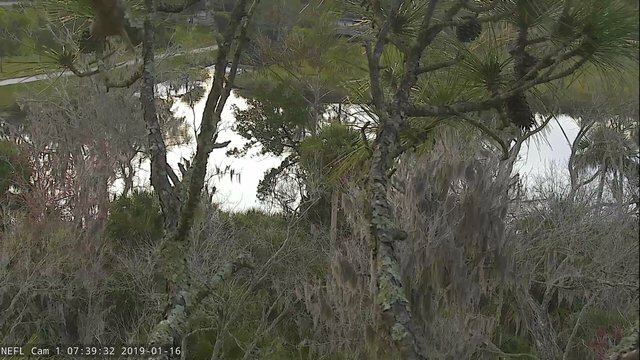 jd_AEF (Moderator): I have now switched cam views to give better look at A2...She is now on cam two on Sunset branch and Samson is on cam two with only his tail showing. Jan 17, 1:20 PM leigh_AEF (Moderator): Good morning! 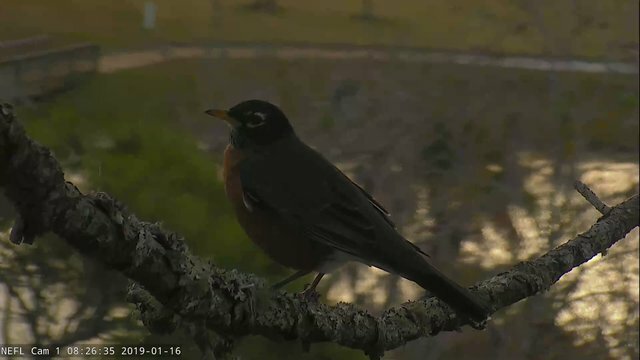 Both move to the Wallenda branches at 7:19. Jan 17, 1:27 PM leigh_AEF (Moderator): Off they fly together at 7:27.
aka_AEF (Moderator): Good afternoon Hamlet family! What a lovely day for eagle watching! At 1:13, we are still watching for eagle arrival.